Colorful and familiar turtles, alligators, cypress knees, lily pads and white cranes are visible throughout the 2,300-square-foot mural on Tallahassee’s Gaines Street — a largely volunteer project designed to capture the lively essence of the Florida landscape and wildlife. 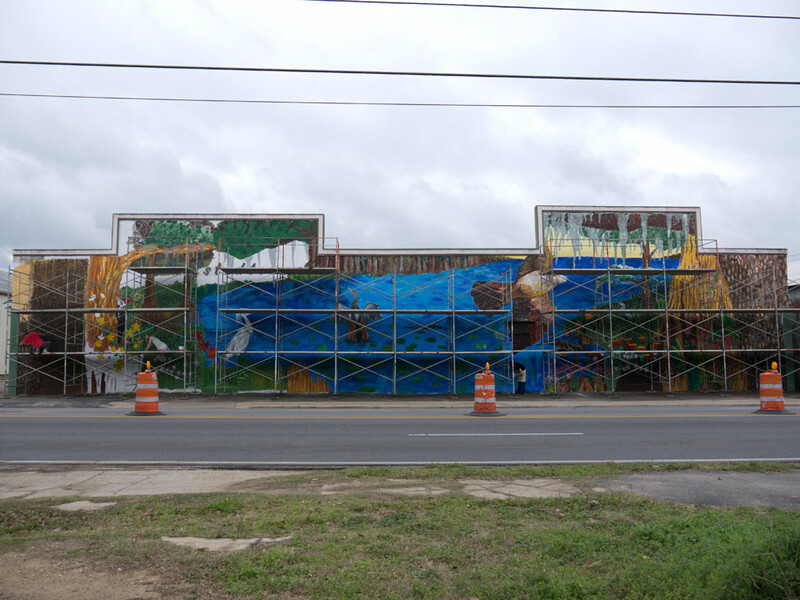 Florida State University’s Department of Art Education recently collaborated with the university’s annual Seven Days of Opening Nights festival to create a massive mural on the side of the old Carlstadt Building. The expansive outdoor painting depicts a detailed and vibrant nature scene that uses an extensive, 29-color palette. Rachel Kosberg, a senior at Florida State, is one of the artists who worked on the project. Florida State faculty and graduate students oversaw the project and encouraged volunteers from the Tallahassee area to join in on the effort. SAIL High School, Pyramid Studios and other local schools and organizations all loaned volunteers who helped paint. Michael Sperow, a Florida State graduate student studying art education, said he loves meeting new people and coaxing them to pick up a paint brush for the first time in their lives. Dave Gussak, chairman of the Department of Art Education, said he believes that the mural project is a great way to bring both the Tallahassee community and the Florida State community together.